Major General Dharshana Hettiararrachchi presents a memento to journalist MA Phakurdeen. “Due recognition should be given to others’ religions and their practices. This should pave the way for communal amity and inter communal harmony,” Jaffna Security Force Commander Major General Dharshana Hettiarrachchi said. He was addressing the journalists, representatives of Civil Societies from the East at the Auditorium of the Jaffna Security Forces Head Quarters on Sunday where the top tanking Officials were present. A group of journalists along with the representatives of various civil societies in the Ampara District were in the Jaffna Peninsula on a two-day exposure tour to inspect and encourage the humanitarian services by the Army personnel to give them new life. Journalists earlier witnessed handing over ceremony attended by Major General Hettiarrachchi and other higher ranking Officials on Saturday. 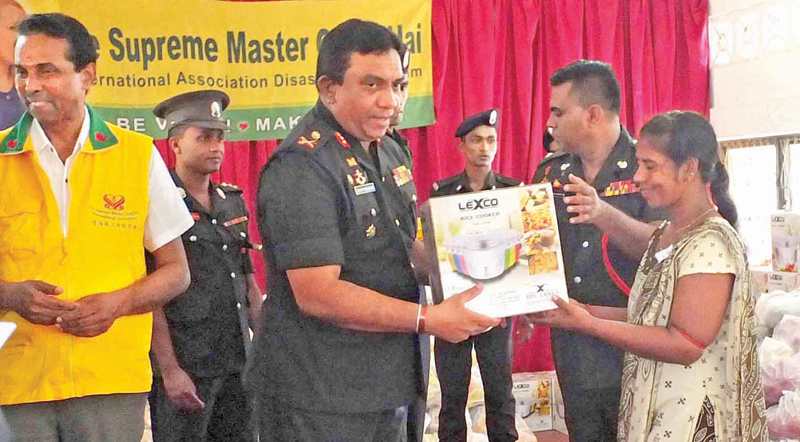 The journalists participated in a program at the Auditorium of the Security Forces Head Quartered in Palali where cycles were donated to under-privileged students under the patronage of Major General Dharshana Hettiararcachchi. The President of the Ampara District Journalist Forum (ADJF) MA Phakurdeen was presented with a memento by Major General Dharshana Hettiararrachchi and this was followed by a memento to Major General Dharshana Hettiarrcachchi by ADJF President Phakurdeen. On the second day, the journalists visited Poompukaar where the construction of toilets by the Army Personnel were going on.